I recently have noticed many people tie the "sheet bend" this other way that i have never seen before. So my question is which one is the sheet bend, and if the other one is a sheet bend as well, or a completely seperate knot, and if it is a seperate knot, what is the name and/or ABOK #? have you got a copy of the ABoK? because the Sheet Bend is #1 ! Your second picture (bottom) is a (Right-Hand) Sheet Bend (#1431) (the tails are on the same side = the "true" Sheet Bend), whilst the sequence showed in your first picture (up) is for a Left-Hand Sheet Bend (#1432, tails on opposite sides) that (as Ashley said) "is not so reliable a knot as #1431" (the Right-Hand Sheet Bend). Thank you very much, and yes, i am an owner of a copy of the ABOK and i did see that the sheet bend was #1 right after i posted, (i felt dumb), but i still was wondering what he other knot was, so i decided to not take it down. either way, Thank you! and perhaps even stronger (unlikely to be or matter much). to an eye --both legs of U-part being loaded. The hardest Nip/hardest rope pressures don't trap the Bitter End of the Bight side only the Hitch side with most intense pressures. i thought Dr. Cyrus Day argued this, and said 'Left' was right; or at least equal. i don't have "The Art of Knotting and Splicing"/Naval Institute anymore, but thought i had read this arguement. Make a Round Turn around (only really need to trap end 1x) neutralizes arguement. Extend to Simple Simon Over (at least 1 over); even better and cleaner package/ no right angle sore thumb pieces. Day says the opposite side version is inferior, but also has a paragraph talking about E.D. Fowle's (from 'Textile World, 21-May-1927, pp. 96-99) statement about the opposite side being preferred because it blends with the fabric better. on both ends (100% vs. 50%, SPart vs. eye leg). single bottom arrow on Sheet Bends, but double arrows / half force each side of eye for Bowlines. Thus in Sheet Bend, each side is tensioned same AND just as stiff/hard from said tension. Bowline however, has the S_Part leg as single, most loaded ; because eye pulls are divided. >>tail outside misses getting sandwiched into this target. Here in free floating knot w/o host that hitch would Nip against, lacing must provide it's own HARD surface is key. In either mechanic, the hitch side tries to trap the bight side that is trying to escape. In the Bowline, there is only half as much force on the escape/ bight side; but full force on trap hitch side. Click on item #2 in the table (Bowlines Analysis). I think he's referring to the fact that the end will work its way loose if the knot or cable clamp is tied (applied) backhandedly. 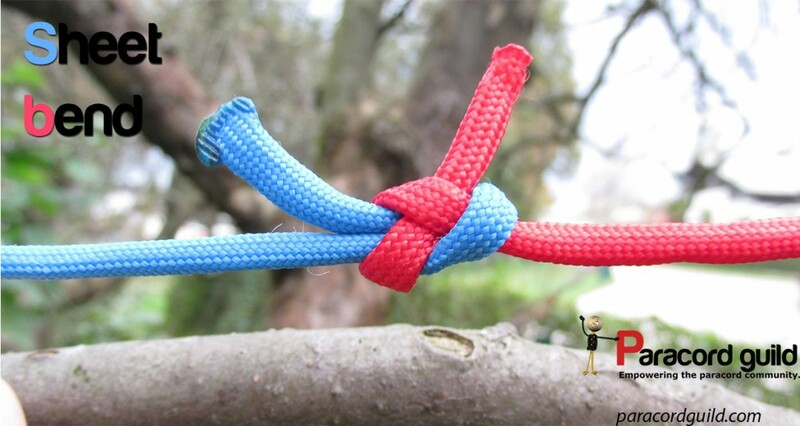 A Sheet bend isn't an 'eye' knot. Unless you were thinking of a 'Becket' perhaps? Security is thought to be improved in one orientation of the Sheet bend versus the other (ie #1431 v #1432). As far as I know, there doesn't appear to be an in-depth paper describing/explaining why one orientation is more secure than the other. Such a paper might exist...but I have yet to find it. No doubt, someone in the IGKT will know if an in-depth treatment of the Sheet Bend has been done (in a published paper). Obviously, the material that the rope is constructed from will play an important role (eg vegetable fibre versus modern synthetic lifelines)...including the effect of a 'hawser' / twisted lay of the rope. I decided not to publish the cable-grip analogy in the Bowlines paper because I had difficulty with developing a theory to link the two systems. On steel wire rope, the cable-grips are oriented so that the 'saddle' lies on the SPart (or 'live' end of the cable). The 'U' bolt lies on the tail. In a #1431 Sheet Bend, the SPart of one rope is oriented so that it clamps/crushes the 'tail' of the other (opposite) rope. This appeared counter-intuitive to me when trying to develop a rationale for why cable-grips must oriented as such...and why a Sheet bend allegedly is more secure when the SPart of one rope initially contacts and crushes/traps the tail of the opposite rope. There is more going on here (obviously) - because one rope is actually trapping and crushing its own tail. Anyway, this has been something that I have been thinking about for some time - but could not correlate my thoughts sufficiently well - so i did not advance it further. Bowline paper very nice rite down to color choice! in my imagery i think there are 3 force parts in Bowline to watch for, to see Left Hand doesn't Nip as well. and blurring it more see, whether positive/negative, north/south, male/female etc. so doesn't incur their direct forces, only residual/side forces. to trap into it, Bitter End needs to turn towards, not away from S_Part. Even in Sheet Bend, theory carries; even though 2 Bitter Ends now. The Cross Over Loop/Hitch is the lock, the Bight is trying to escape. It must end up on top of it's own S_Part, that bight S_Part seeks (so gets Nipped between). between the 2 Equal/Opposite forces seeking each other (or not). So, Bight Bitter End must again end up towards, not away from lock/hitch side S_Part for best Nip. Left Hand (Bowline) doesn't Nip as well. Is this something you have tested and proved? The term 'left-hand Bowline' is problematic - in consideration of handedness / chirality. The nipping loop of a Bowline can be described as being left hand (S twist) or right hand (Z twist)... same as a coiled spring - which can be Z or S twist. I would immediately point out that #1034 1/2 Bowline is in fact more secure when ring loaded. In contrast, #1010 is insecure in a ring loading profile. Tail orientation in a Bowline is - in my view - not a primary factor for measuring security of the common Bowline in a straight line axial loading. In terms of a Sheet bend (which isn't an eye knot) - I had posited that there is no nipping loop - and therefore, the way it functions is different to a Bowline. 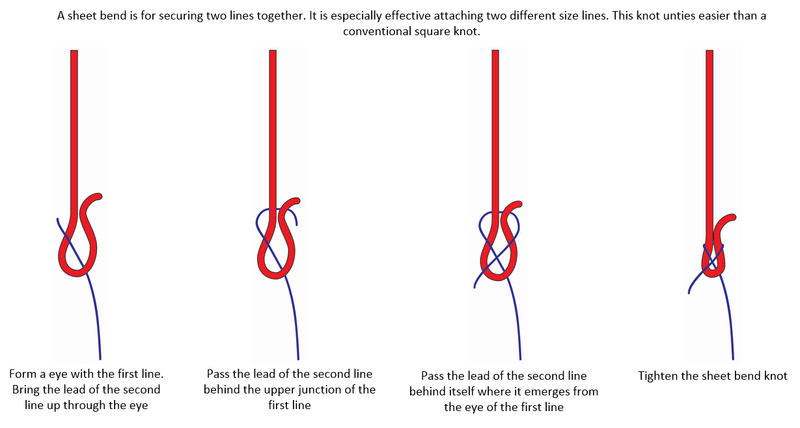 Derek had posited that Bowlines have an 'SB core' (sheet bend core) - and he discussed this at length with diagrams in the Bowlines definition thread. However, I think the definition of a nipping loop has been tightened, and as such, the core of a Sheet bend does not function in the same way as the core of a common (#1010) Bowline. There are similarities - but the nipping loop is key to the Bowline structure - and is missing from a Sheet bend. Modern synthetic fibre 'kernmantel' ropes also behave differently compared to hawser lay vegetable fibre ropes. Mountaineers in the 1950's routinely used the common bowline as a 'tie-in' knot to their body (pre-harness era) - the ropes were of a hawser construction and vegetable fibre. Modern climbers who use synthetic fibre kernmantel ropes must modify the common Bowline with tail maneuvers to render it secure. I think the Sheet bend is also affected by rope type.